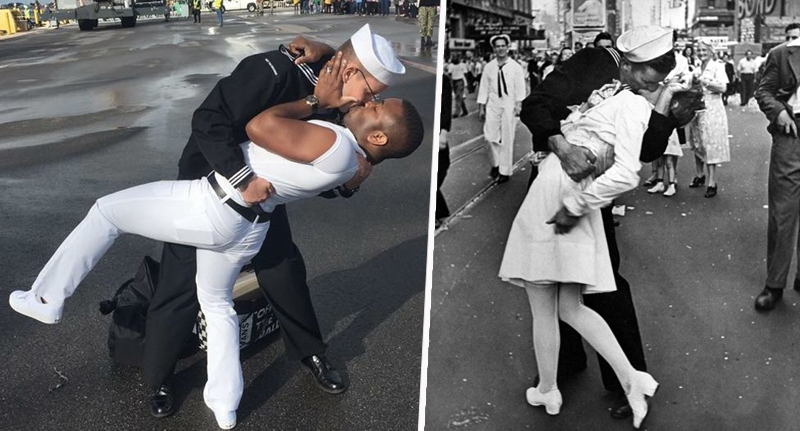 A Navy sailor has recreated an iconic Second World War photo with his husband in celebration of his homecoming just in time for Christmas. Bryan Woodington, 33, had been serving away from home in the Persian Gulf and Europe for seven months before returning back to his family on Friday December 21. He was one of 300 sailors returning to their families right before Christmas – and he and his husband, Ken Woodington, both of Jacksonville, Florida, celebrated accordingly. Ken was among the hundreds of Navy families waiting on the docks at Naval Station Mayport to welcome their loved ones home wth cheers and signs, watching as The USS Sullivans pulled into dry land. Upon their reunion, Ken and Bryan were overcome with joy and, in their embrace, managed to recreate one of the most iconic images from WW2. 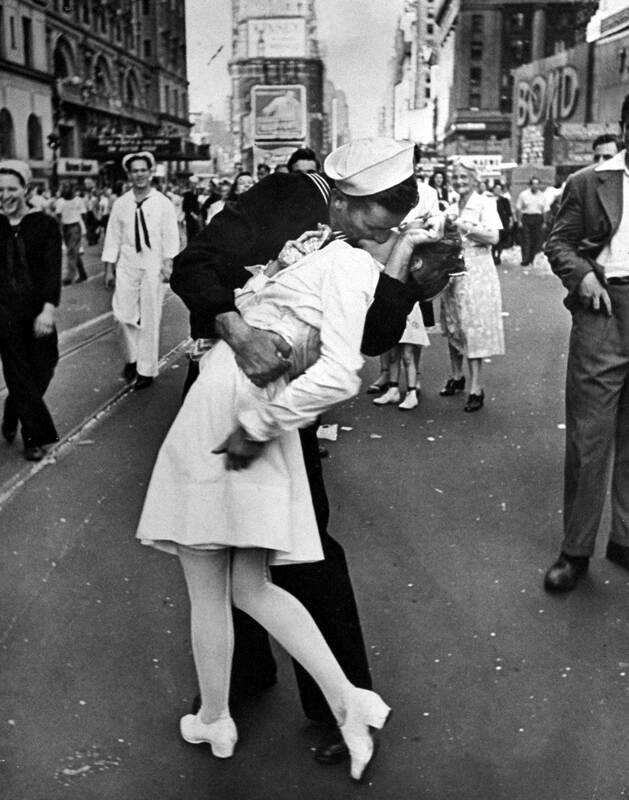 The picture, titled V-J Day in Times Square portrays a US Navy sailor grabbing and kissing a stranger — a woman in a white dress — on Victory over Japan Day in New York City’s Times Square on August 14, 1945. The photograph was published a week later in Life magazine, among many photographs of celebrations around the United States that were presented in a twelve-page section titled Victory Celebrations. Ken and Bryan’s version might not be celebrating military victory, as such, but who says the power of a joyful reunion between people who know and love each other isn’t just as beautiful? It was a lot. I miss him very much, and it was our first deployment. And I’ve never been away from him that long. It just means so much to have him back. Bryan had been serving on the USS The Sullivans, a guided-missile destroyer named after five brothers who enlisted together and were killed in World War II, which was deployed to the Persian Gulf and Europe about seven months ago in May. During its deployment, the ship and its crew supported maritime security operations and navigated more than 40,000 nautical miles. Hopefully those sailors have been able to spend some quality time with loved ones over the holidays. Meanwhile, Ken and Bryan have a picture perfect moment by which to remember their joyful reunion. However, as if only to prove the bigotry many gay couples are faced with, soon after the photograph was picked up by local news stations, News4Jax was ‘bombarded’ by hate messages. ‘How sad that your station has dropped to such a low as to show a gay couple kissing on your newscast,’ one wrote. I’ll never watch your news again!!!! So long, News4Jax. I thought this was a ‘family friendly’ news channel. However, the negative comments did not get to the happy couple as they focused on relishing their moment. It didn’t really bother me. Honestly, I’m the type of person who doesn’t really care that much about what people say. There are people who see the beauty in it. As for those who don’t, have a nice day. We’re showing our love for each other, we’re not hurting anyone. I’m just a spouse waiting for his sailor. The couple won a lottery competition to mimic the famous photograph from the ’40s – a ceremonial tradition aired on local news – so Ken certainly had his white trousers cleaned and nicely pressed for the reunion. Merry Christmas and a Happy New Year to Ken and Bryan!